For years fragmentation has remained the crux of the multiscreen world, but now the time has come for operators to truly commit themselves to resolving this issue. Consumers have access to more devices and content types than ever before and are also increasingly demanding access to content both in and outside of the home, supported by the rise of connected entertainment devices and the connected car. In out latest white paper, written in partnership with Verimatrix, we go back to the roots of multiscreen and present a three-step approach for operators seeking to maximize the potential of their multiscreen services. Serving a plethora of devices, syndicating content sources efficiently and securing the delivery of all assets are the three fundamental steps that all operators need to follow. 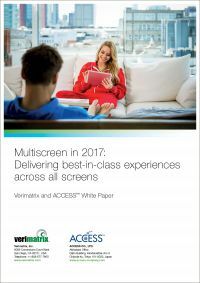 To download the Whitepaper "Multiscreen in 2017: Delivering best-in-class experiences across all screens", please fill in the short form on the right. Fields marked with and asterisk * are mandatory. Please make sure that your email address is correct as we will directly send you the PDF download link. Please fill out the form below to download the Verimatrix and ACCESS™ White Paper. Mandatory field Human? * What is the sum of 9 and 2? What is the sum of 9 and 2?